The Rowing Machine by WaterRower - Slider Dynamic boasts a boat-like design unlike any other rower! Along with its dual rails, footrests keep your feet positioned similar to in boats. Simulating boat movement, it also features crew simulation, which allows for teams to practice by simply locking the connecting bars in place -- all done in seconds! 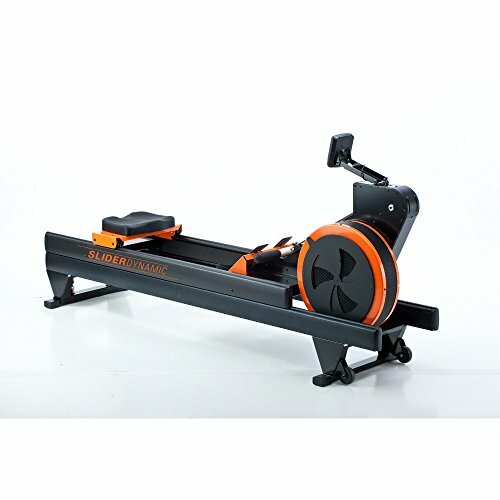 Whats more, it includes a training monitor: The SliderDynamic Training Monitor (SDTM), which monitors your performance and provides you several displays and features that are particular to rowing. Additionally, it consists of transportability characteristics with its built-in leveling rear leg, locking plate, and wheels. Moreover, comfortable seating is an experience to expect, along with the ability to adjust resistance levels. So what are you waiting for? Avail the Rowing Machine by WaterRower - Slider Dynamic today!